Every other Thursday or so the boys and I celebrate “Thirsty Thursday”. It is nothing more than an excuse to bust open some fine craft beers midweek and forget that it’s not the weekend yet. A few weeks back G-lo was sans family so instead of drinking at home the two of us decided to hit our favorite Beer Bar (The Pour House) for some brew on draft. 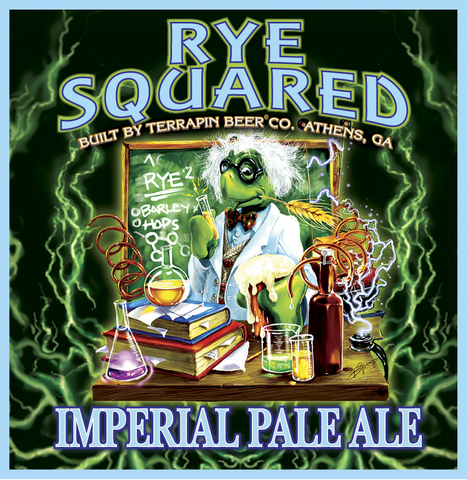 We had some great brews but I was particularly impressed by Terrapin’s Rye Squared. Now I love rye beers (check out our review of this Rye Porter) and rye beers are back in vogue (check out Joe Sixpack’s article) but the Terrapin Rye Squared takes rye beer to a new level. Terrapin has taken all the rye goodness of their year round Rye Pale Ale and doubled it exponentially. Taste: The overload continues …. Hops and Peppery Rye flavors upfront mellowing into sweet malty, floral, citrus goodness with an astringent bite on the back-end from the hops and high alcohol content. This a serious rye beer for rye beer and IPA lovers and not for those who like a mellow beer. The beer is the bully on the rye beer playground. It will slap you in the face and say “You like that? Good! Here’s some more”. If you love big beers this is the one for you. Look for it seasonally released by Terrapin around February. Hopefully there are still a few bottles left on the shelf of your local brew purveyor. Other beers I had on this Thirsty Thursday outing include Terrapin’s Sunray Wheat and Weyerbacker’s Oscar. These wheat beers never stood a chance, the Rye Squared kicked both of their asses. I shall add that to my wish list. Thanks for the recommendation Wookie! It’s a must try, in my humble opinion. Humble? The Wookie? Feelin ok? ….. and a Shame Burger. 1. MUST be completed within 45 minutes! 3. Plates and glasses MUST be wiped clean! 4. MUST stay seated for 5 minutes after the challenge is complete! 5. You may still be chewing at the 45 minute mark but remainder MUST be swallowed within 2 minutes! If the SHAME Burger from HELL Challenge is completed The Wishing Well WILL PAY FOR YOUR MEAL, give said finisher a $25.00 gift card and a photo on the Wall of SHAME!!!! Shhh…. listen! I think I hear The Alemonger keeling over after reading this. Oh wait… he never made it to the end. We lost him when he saw Scrapple mentioned. My money is on Limpd for this one. I would probably explode in the middle of my 2nd beer. Can you say, “Wahfer thin mint” in an OUTRAGEOUS French accent? I can’t comment on that review yet. I’d like to. I’ve had the beer. I’ve had it at the PourHouse (along with a couple hundred others during various research projects). The problem is that I can’t comment until tomorrow because it isn’t Thursday until then. Unless it is – which it might be thanks to that silly little worm hole time space continuum rip that limpd cast upon the interwebs the other day. I eagerly await the “mind droppings” from the Monger when comments are added tomorrow. I suspect that you approve of this brew. It’s more than half way over. I think he means the drinking part of Thursday. That should start around 9pm!! Drinko De Mayo! Rye Beer and Rye Bread have little in common when it comes to taste. In beer, I feel the Rye adds a spicy almost peppery richness. Look for Terrapin’s regular Rye Pale Ale (the little brother of this beer) as a good introduction to Rye in brews. OK, I know it’s still a bit early but I can’t wait any longer for Thursday….. I haven’t quite decided yet where Terrapin belongs in my Byzantine mind of craft brew and brewer rankings. I’ve had 5 or 6 of their beers and I’ve been very impressed with a couple but very disappointed with a couple others. Not uncommon – can’t expect to like everything that comes out of a particular brewery (I even found a way NOT to like something from Stone – although Highway 78 on draft is much better than it’s bottled brethren). Anyway, Rye Squared is one of the brews I really like. As you said, it makes you stand up (or sit with purpose) and take notice. Aggressive but not overpowering. It’s a dangerous brew in that regard because it’s sneakily refreshing and despite the powerful flavors it doesn’t call out for you to stop after just one. The Monger and I agree on something …. It’s the first sign of the apocalypse …. repent now! You’ve agreed on a few non-cheese things. The Wookie was kind enough to share the Rye squared on a recent Sudsy Sunday and I have to say that he has found a powerful brew. The complex flavors combine to provide for a rich full-bodied experience. While too much for a session beer, this was a great change of pace.